Art in a Garden contains work about flowers, gardens, harvesting, flowery landscapes and more. Please check out our lovely show at the Old Hyde Park Art Center from 12PM to 3PM Tuesday, February 12th, 2019 to Friday, March 8th, 2019. You're invited to attend the reception on February 14th. 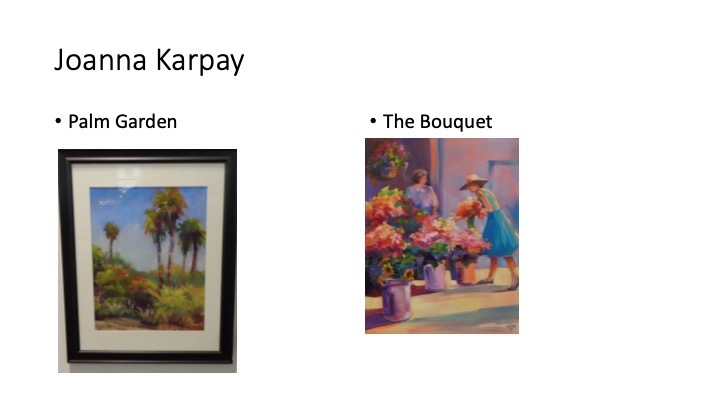 •1st Place: “Palm Garden” / Joanna Karpay This painting showed excellence in artistic maturity and expertise, most notably was the artist’s skill in efficiency of stroke and how there seemed to be no wasted mark in making its final result as an outstanding painting. The composition was strong and pleasingly offered the viewer’s eyes to journey through the painting with ease and excitement. The balance of painterly strokes with hints of detail in the right places kept the painting energetic and lively. I also was intrigued by the pleasing color palette and particularly loved the slight hint of cerulean blue in the distance. Overall, well done and congratulations. •2nd Place: “Yellow Chair” / Judith Baizan This painting grabbed me at first sight. Not only was the portrait of the girl rendered with wonderful skill, but the sense of intrigue was strong in this piece. I felt it represented the show’s theme beautifully as I found myself wondering why the girl was deep in thought in her garden setting. Did she just get up from the yellow chair, or was she thinking of a special someone who had been there before? Not every artist can create a feeling as well as a beautiful painting and I felt this did both. The compositional choices were very strong and I found myself wanting to explore more of the girl's natural surroundings. I was visually pleased with the simplistic style of the background tree and uncomplicated single color of the sky. I felt these decisions were well-planned artistic elements which kept the viewer focused more on the emotion of the girl and wonderment of the yellow chair. A beautiful painting… congratulations. •3rd Place: “Spring Flowers” / Barry Schwartz This piece was a treat for the eyes and portrayed “the garden” theme in a fantastic interplay of color and texture. All of this particular artist’s submissions of stained glass were wonderfully rendered, but this one had composition and color that was harmonious and fascinating. I was mesmerized by the dance of color and botanical selections which made for an overall beautiful piece of art. •Honorable Mention: “Splash of Spring” / Derry MacDonald The freedom and luminescent quality of watercolor was beautifully rendered in this painting. This artist is to be praised for a skillful balance of looseness that was controlled in a manner to create a stunning display of floral beauty. This artist presented a familiar subject of a bouquet of flowers in a way that felt like a beautiful dream. •Honorable Mention: “Crawford Creek” / Leigh Bohne What a beautiful oil rendering of a familiar theme for many Floridians and other southern states. As an artist myself who loves the “marsh landscape” I could instantly see the this painting was a beauty. I particularly liked the warm color palette and skilled handling of the reflections. The sense of distance was nicely achieved in drawing the eye back into the painting to explore the purplish distant landscape. •Honorable Mention: “Full Bloom” / Neil Craine This piece was a wonderful display of color and life. I love when a botanical painting can achieve a feeling of personality from its subject(s). The sunflower seemed to have a positive and radiant life as it reached high and with purposeful intent. I particularly loved the texture and slight abstract nature of the foliage. I felt the artist wasn’t afraid to be free and bold with this work which resulted in a beautiful piece of art. •Again, congratulations to all. Your art made my day.